The mailman brought me another subscription copy of THE FLASH, folded in half as was the style of the era. This was always an exciting moment, because it was unexpected. I suppose I could have worked out approximately when a new issue would be showing up, but I somehow never bothered. 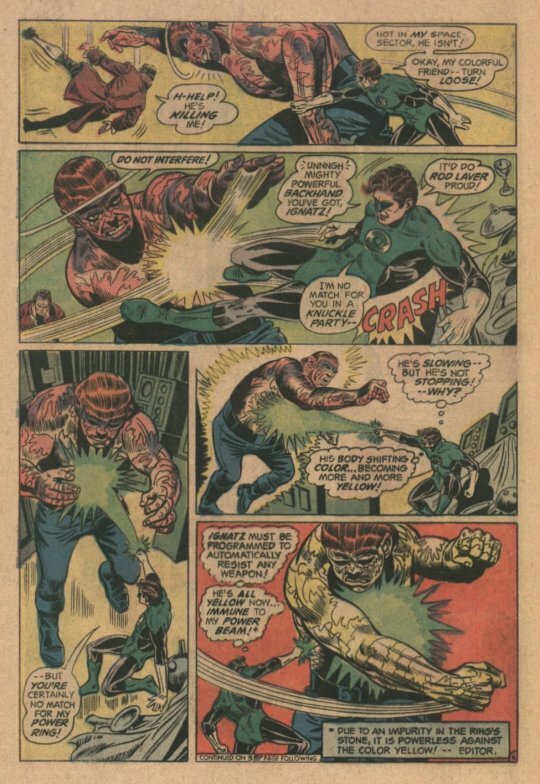 This is the story that really cemented my vision of the Rogue’s Gallery as guys who talked a big fight, but who really wanted nothing more than to make the Flash look like a chump. They were all colorful and interesting, and often possessing the ability to create absurd weapons and gadgets out of nothing and despite having no great education for it, but they weren’t actually all that dangerous–they didn’t seem to really want to hurt anybody. 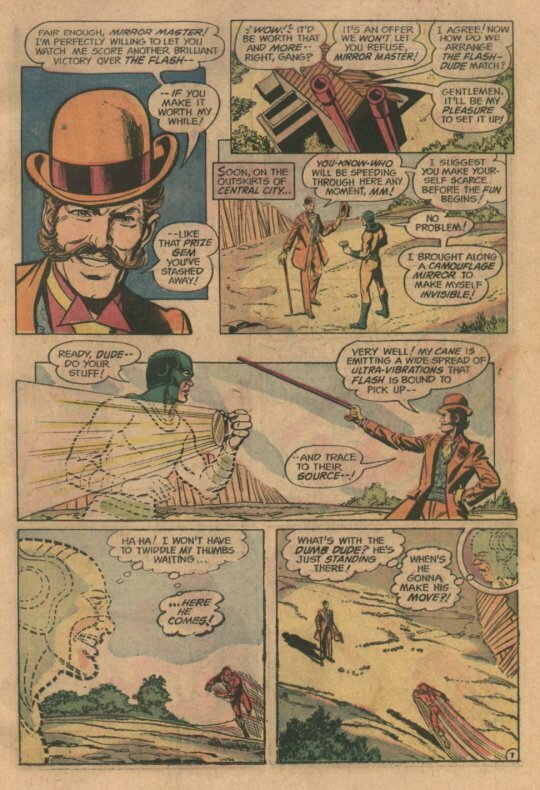 The story opens up with a trio of vignettes depicting Mirror Master, the Top and Weather Wizard having the upper hand on the Scarlet Speedster. 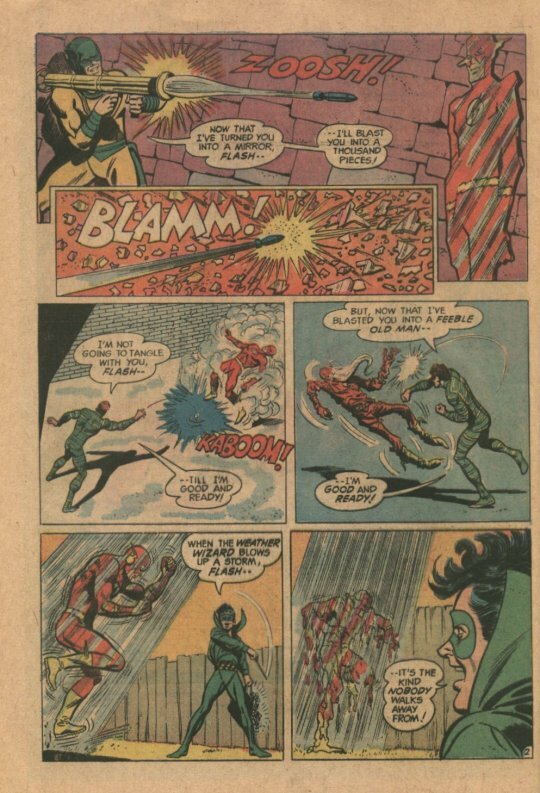 These were all based on classic Carmine Infantino issues, although I didn’t realize that at the time. These aren’t flashbacks, though, but rather re-enactments! Because the Flash Rogues are holding their annual convention! What a wonderfully crazy idea that is–and as a kid, I completely took it at face value. In any event, the grand prize for the best new Anti-Flash weapon is a priceless jewel that Mirror Master has heisted. 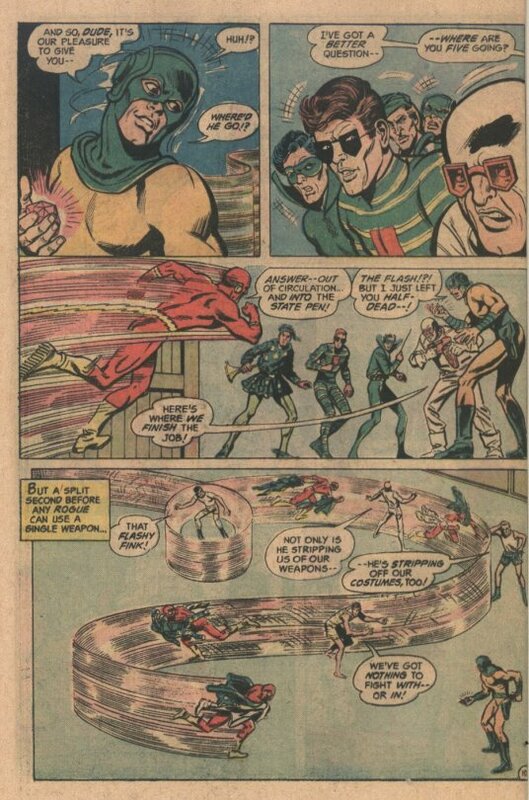 But before the demonstrations can begin, the event is interrupted by the arrival of a figure calling himself The Dude, who claims to be a Flash foe that has triumphed over the Scarlet Speedster in all of their encounters. 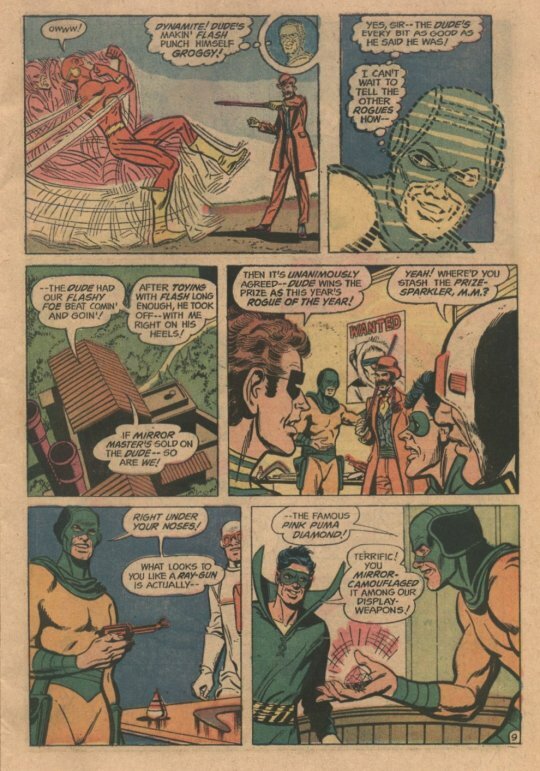 The Dude’s brought photographic evidence of his past victories, but the Rogues are skeptical–particularly Mirror Master, who sees this as a transparent attempt to heist the prize gem from them. But the confident Dude offers to battle the Flash again, where Mirror master can watch their battle and see for himself. The Dude draws the Flash to their location with high-frequency vibrations from his cane, and proceeds to beat the tar out of the Flash. No matter what speed-trick the Flash employs, the Dude has the perfect counter for it. Mirror Master walks away a convinced man, and they return to the Convention so that the Dude can claim his prize–the stolen Pink Puma diamond. 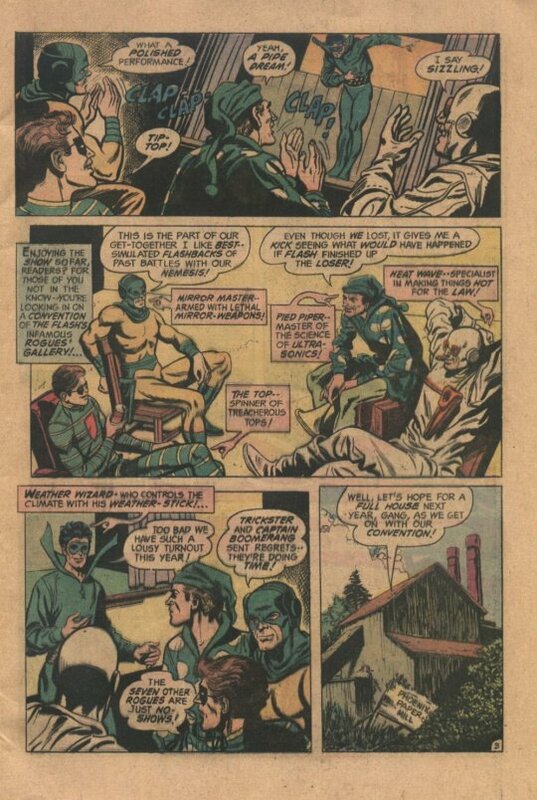 But as soon as Mirror Master brings out the prize, the Dude disappears and the Flash shows up, rapidly stripping the Rogues of their weapons and even uniforms, completely disarming them. 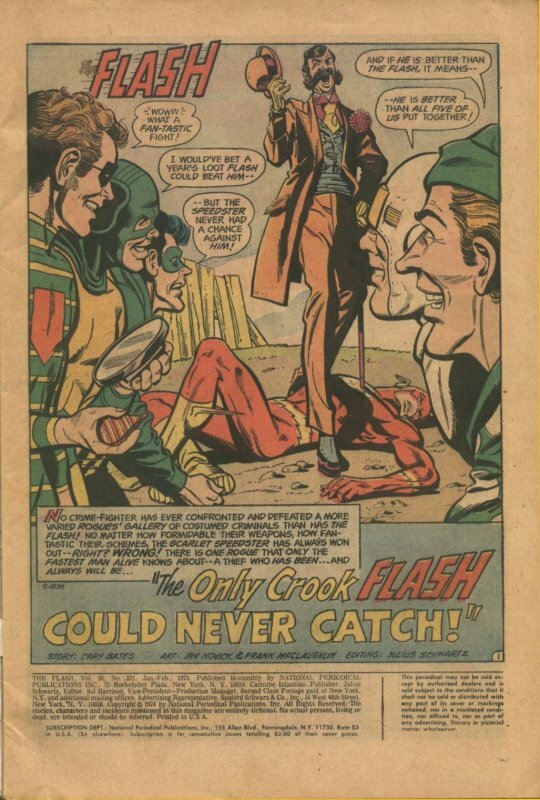 Of course, the Dude WAS the Flash, using super-speed so as to appear to be in two places at once, and he played this masquerade in order to locate the missing gem so that he could recover it. The Green Lantern back-up stork is equally bonkers. It picks up where last issue’s tale left off, with the revelation that Aaron Burr is still alive and has been in space. Burr explains to GL that before he could fight his famous duel with Alexander Hamilton, he was scooped up by aliens who needed his help in ending their civil war. A simulacrum was left in Burr’s place to face Hamilton. But now, the job mostly done, Burr longs to see the world of his birth again. But not everybody is a big a fan of Aaron Burr as writer Denny O’Neil seems to be. His alien servant Ignatz turns out to be an assassin sent by the opposition to kill him. 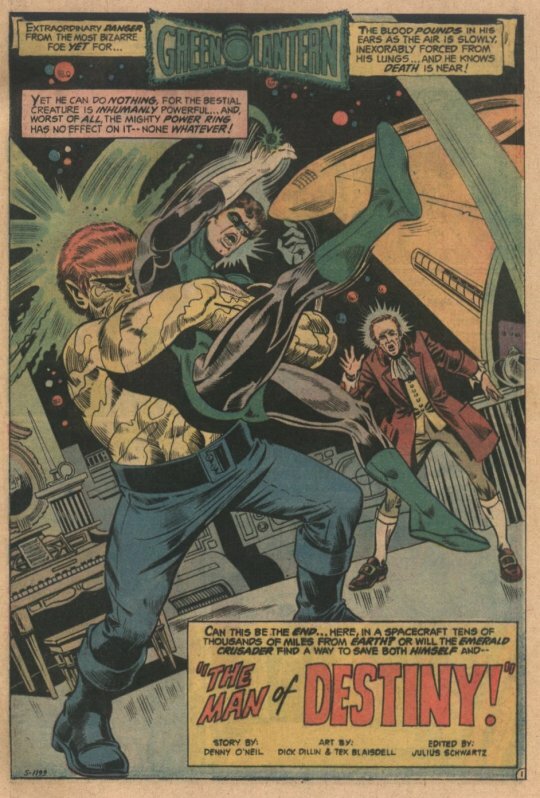 Green lantern puts up a furious battle, eventually ejecting Ignatz into space, thereby allowing Burr his moment on the Earth before the diplomat too must return to his adopted planet.